Because I was raised in home where my parents and grandparents were immigrants from Italy, food is an essential part of my being. Good homemade food equates to love, and sharing it with my friends and family is the way I have learned to show my loved ones I care. Throw an Italian-themed dinner party and serve these recipes to your friends and family — they’ll taste how much you care. Here are some authentic Italian American recipes that I serve when I gather my friends and family for a long, soulful, delicious meal. A lot of love goes into each dish! “The good things – you put out.” That is what my dad Angelo always says about entertaining and having people over. Growing up a first generation American in an Italian household, we always had company. If we didn’t have 10 or more people at our home for dinner, we were at someone else’s full house. But it wasn’t a scene from the TV show The Sopranos, it was real. We didn’t speak with our hands, or chew with our mouths open, or talk about “hits.” We talked about school, current events and sometimes gossip. While I grew up with relatives that didn’t speak English – and still had family members who lived in Italy – the first time I really noticed that we were different was when it came to entertaining. In fact, I realized this the very first time I had a boyfriend come over to meet my family. My mother started shoveling polenta and flank steak into his plate, there was loud conversation going on in both Italian and English, and my grandmother (who didn’t speak a word of English) kept insisting that my date (who didn’t speak a word of Italian) could understand her. My date, needless to say, was overwhelmed and visibly shaken by the commotion…and I was unsurprisingly embarrassed. But one of the most enlightening moments came shortly after when I went to meet my boyfriend’s “American” family. I was offered a glass of water and a chair and that was it. I walked away not only thinking “how rude,” but I also felt incredibly proud to be part of such a generous, warm family. Money is not a care! Food is! In a real Italian American home, when company comes over, sausage, Parmesan cheese, olives, and fresh bread is served as antipasti – a first course. The finest fish, meat, and drink then follows. This type of feasting was never done when it was just the immediate family, but when friends or extended family was in your home, you were to act like money wasn’t a care! Maybe this is why, as a child, I loved the holidays – it was time to eat fra diavolo sauce, fried shiners and grilled goat! When it comes to true Italian American entertaining, it is not about the decor, the music or even the lighting, it is about the conversation and the food. As I got older, I always wanted to incorporate the things I read in American home magazines with the things that my Italian family does. I wrapped the brasule in red and green string for Christmas, only to be told by my grandmother that I would poison people or, worse, ruin the meat! I served wine in fancy crystal goblets, only to be told by my father that he couldn’t drink out of a goblet and to just give him a regular glass (a double old-fashioned). I lit candles and dimmed the dinning room lights to create a mood, only to be told my mother that she couldn’t see and I was going to burn the house down. And at almost every occasion from when I was seven years old I have tried to put flowers on the table, only to be told that flowers bring in bugs. For true Italians, food is the centerpoint of meals – enjoying the different dishes and their flavors as well as savoring every moment of every chew. This slow food enjoyment is the reason a real Italian American dinner party always lasts for at least five hours! To us, eating and cooking is a form of great love. We eat slow, there are many courses, and the in between is filled with laughs, gossip, guilt and advice. Fuss-free dinner presentations are preferred. Now, when I have people over to my home, I combine all that I was taught as a child about serving the best food – and plenty of it – following American trends as well as the Italian culture in which I was raised. I make it a point that my guests feel very special by serving them the most wonderful treats. For example, instead of olives I serve olive pate on crostinis, and instead of simple sliced prosciutto I make pasta with cream, prosciutto, peas, onions and black pepper. But to stay true to my American side, I have abandoned the plain white tablecloth and I serve wine in goblets not juice glasses. 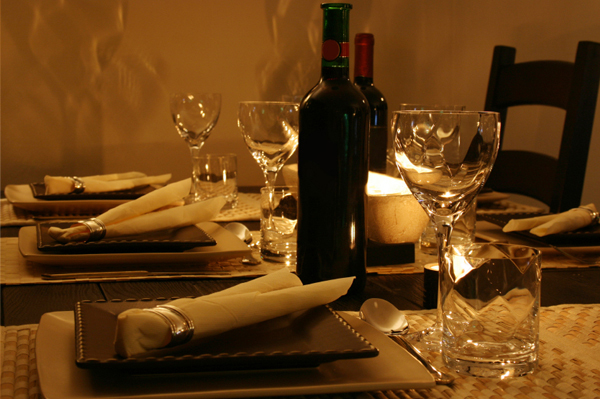 I also set the mood of the dinner party with candles and linens. However, I don’t take the decor too seriously because I am, after all, my mother’s daughter. I was taught by my Italian roots that if you have good food, you have love, but my American side taught me that when I have food it is a party! Enjoy these Italian American recipes. Place all ingredients for olive pate in the bowl of a food processor and blend until smooth. Transfer to a serving bowl. Place ingredients for mortadella spread in the bowl of a food processor and blend until smooth. Transfer to a serving bowl. Serve chilled or at room temperature. 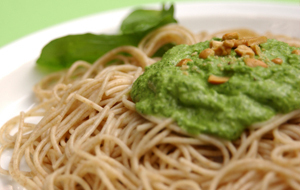 My Grandparents always had tons of basil growing in the garden so we would eat plain pesto sauce on pasta all summer. Now in my kitchen I’ve changed their original recipe just a bit to make it edgier and better suit my current tastes. Cook pasta in a large pot of salted boiling water, according to package instructions. 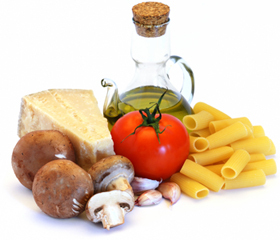 While pasta is cooking, place remaining ingredients in the bowl of a food processor and blend until smooth. Save about 1/4 cup of the water from the cooked pasta. Drain pasta in a colander. Transfer pasta back to large pot and pour sauce on top with Parmesan cheese, if desired, and add pasta water a drop at a time to thin the sauce (adding the water is optional some people like the sauce thick). Serve at once or warm or cold – this dish is great either way! When planning a dinner party, I always cater to the tastes of my guests – I learned this from my mother. My friend Jen is a fan of polenta, but she equally loves chicken, so, for dinners with her, I always make these polenta chicken cutlets. Mix the polenta, flour, salt, pepper, and red pepper in a wide shallow bowl. In separate bowl, mix the eggs with the Parmesan cheese. Heat oil in a large pan over medium-high heat. Dip the cutlets into the egg mixture then into the dry mixture, coat very well. Fry chicken, turning occasionally, until cooked through (you may have to do this in batches, adding more oil as needed). Serve immediately. >> Get our favorite Italian recipes, travel tips, decor, style & more!